Need More Color? Click here! Speedcross 3 CS Sonic Pro Break The PB Barrier Everytime Fast, fluid and with superb fit, the SONIC PRO will help you keep the tempo high in the city. Upper - Precise and Secure Construction. 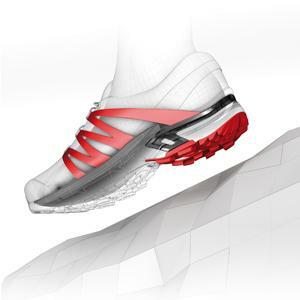 Wrapping the foot with support and comfort, the Sonic Pro employs varying technologies to offer the best fit possible. A 3D open stretch mesh makes up the underlayer which provides maximum breathability, letting fresh air permeate the interior to keep the foot cool and refreshed. Externally it features Sensifit technology - a system that Wraps to the foot with a precise and secure fit, Sensifit cradles the foot from the midsole to the lace system, providing a stable, precise, snug fit all around the system. 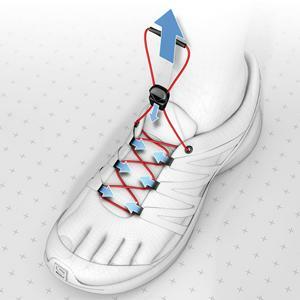 Quicklace is a single Kevlar string fed through friction-free eyelets. As you pull, the lace closes evenly for a better fit, which delivers precision adjustment and a secure lockdown, with a lace pocket to neatly stash away any excess that may get in your way. Midsole - Light Cushioning Compound. When your off-road trek takes you even further off the beaten path, Speedcross 3 CS is there to carry you through. Lightweight construction meets the aggressive tread of the Mud and Snow Contagrip sole for a premium blend of performance and fit. The Quicklace system gets you suited up lickity split so you hit the ground running and never look back. The iconic running shoe that brought speed to the trails! Light, fast, and featuring a super precise fit, the Speedcross 3 provides the ultimate grip in all conditions. - 260 G | 9,2 oz (Size US 7W). - 310 G | 10,9 oz (Size US 9M). Contagrip is a precise combination of geometry, density, and compound, optimized for specific sports and surface conditions. Sensifit cradles the foot from the midsole to the lace eyelets, providing a precise and comfortable fit. Quicklace is a specialized and highly resilient polyester cord running through a series of frictionfree lace eyelets. As you pull, the laces tighten evenly. Lock in place with the stopper and stow everything in the lace pocket. Please follow the size chart below to suggest your correct shoes size. We recommend you to choose one size bigger than normal.